Are you one of the English learners who knows and understands the importance of being a great English speaker, but you just don’t spend as much time learning English as you know you could? Do you waste time watching TV, surfing the internet, and looking at the statuses of people who aren’t even really your friends on Facebook? If you said yes to any of these questions, then you’re not alone. There are many people who are having the same problem. And one of the biggest reasons why people aren’t as successful with having a consistent English practice is because they have not clarified their purpose. Have you ever set goals that you never ended up completing? When you wrote the goal down it probably got you fired up [really excited], and maybe you carried that momentum [kept doing it] for awhile, but eventually you lost your motivation. It’s happened to me many times and it’s likely happened to you as well. First of all, you need to make sure that the goal is what YOU really want. A lot of times we THINK we really want something, but it’s actually the conditioning of our parents, our friends, or society. This happens a lot with English learning. Is becoming a better English speaker something you REALLY want? Or is that what your parents want? Is that what your job expects of you? Or maybe you just think it sounds cool? If YOU don’t have a burning desire to become a better English speaker, than it doesn’t matter how many goals you set, you won’t be uninspired to accomplish them. If you have a lot of self-discipline, you can force yourself to do these things, but eventually you’re going to burn out [get exhausted] or lose interest. What you really want is to be able enjoy the process, the journey of achieving your goals, whether that’s becoming a better English speaker, waking up early, eating healthy, or whatever. How will I feel when I achieve this? Will I enjoy the journey or am I only focused on the end-goal? Write your answers down, don’t just answer them in your head. Journaling or keeping a personal diary is a much more effective way to think than just using your head. What you’re doing here is clarifying why this goal is important to you. The more you understand WHY you want something, the more motivated you will be to achieve this. Would you rather be naturally motivated to do something or have to force yourself to do it [use your willpower]? By taking the time to clarifying the purpose behind your goals, you are setting yourself up for success. So let me show you of how you can clarify your goals with an example conversation between two people. And what types of problems would you want to heal? Okay, see what we did there? Now what’s more motivating? Wanting to talk with people from all over the world or creating peace on Earth? You might have different reasons for learning English and that’s fine, but the point of this exercise is to go into the center of your being and figure out what you REALLY want. Whenever you have a goal, keep asking yourself “Why is this important?” “Why do I want this?” “How is this going to improve my life?” until you get to an answer that really moves you. THIS is your true reason. THIS is what’s going to actually motivate you to follow through with your goals. Most of the time, when we’re asked why we want something, our first answer isn’t really the most accurate. It takes a little searching and thinking and questioning to get to the root of the desire. When you start focusing on the deeper reason you want to achieve something, you naturally become motivated to take action. Imagine you’ve just had a long day of work. You come home and all you want to do is watch TV. But then you read your goal about bringing peace on Earth, and think to yourself, how can I waste my time watching TV when they’re so many more important things do to? Reading your goals every day does not take much effort. But it naturally motivates you to take action on what matters most in your life, whether that’s learning English, being healthy, and/or meditating. So get started. 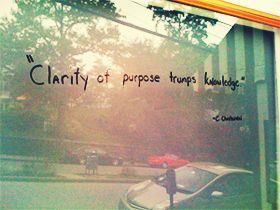 Spend some time clarifying your purpose. Ask yourself why you want to learn English. Ask yourself why it’s important to you, ask what benefits you want to get from it. Keep going deeper and deeper into your true purpose for achieving your English goals into you reach something that inspires you. Then write it down and read it every day and watch how your resistance to learning English melts away. I’ve Clarified My Goals, Now What? If you now have clear idea of WHY you want to learn English, it’s time to put that to use. Check out our free 3 part mini course on simple fluency secrets they don’t teach you in school. Today, I'm not really good in English, but I'll keep learning! Hi, I really like your website however you keep writing than when you mean then. I think you should correct that mistake specially when you are trying to teach others. love your article, after reading this lots of idea pop in to my mind.. I think I should set my goals to become more efficient and effective on my English proficiency.. it really motivate me thanks to your good article.